The rural municipality of East Saint Paul is full of recreational activities for residents. In the winter season, toboggan hills and outdoor skating are very popular. While in the summer seasons, golf courses and lake activities keep everyone busy in the heat. What is less enjoyable about the East Saint Paul area is the continental climate, at least when it comes to your HCAV units. This climate type brings both high humidity and extremely low temperatures to this region as the season’s change. When air conditioners and furnaces are exposed to drastic differences in temperature and weather conditions, functionality and dependability of these systems can be affected. Your HVAC systems are forced to work harder to combat against extremely wet and severely dry air. You may notice your units showing signs of wear and tear right in the middle of the season! That is where Provincial Heating & Cooling steps in. If your HVAC systems aren’t working as they should, or they’ve completely stopped working altogether, our team is ready to solve your heating or cooling problem promptly. Provincial Heating & Cooling has called the city of Winnipeg and surrounding areas home for many years. With more than 20 years of professional HVAC experience, our factory-trained technicians know just how to tackle the worst of your heating and cooling issues. As a Carrier Factory Authorized Dealer for the world-class Carrier products, we can ensure our customers are receiving quality services using top of the line equipment. 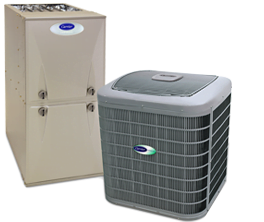 Whether you’re looking to install a new unit or just need a repair on your existing one, Provincial Heating & Cooling is here to help! We want nothing more than to offer our customers convenient and affordable services. With our Pro Service Plan, Provincial Heating & Cooling can provide preventative maintenance, priority services, and all within a 24hr availability and 100% Satisfaction Guarantee! As leaders of HVAC services in East Saint Paul, we value our customers, quality work, and growth over all else. We stand by our service and won’t call it quit until we complete the job the right way. East Saint Paul is an enjoyable community to live in, but only if you can come home to a comfortable heated/cooled environment. If you’re curious about our services, contact us today for a free estimate of your residential or commercial property.